A few weeks ago I received an email from a colleague in the late hours of the night regarding a manuscript I am working on. Attached was a paper recently published by researchers overseas investigating an effect very similar to that which I am attempting to publish. Although my immediate reaction was one of panic I thought it best to neglect the paper at least until the following morning as I saw no point in jeopardising a night’s sleep. Alas the damage had been done and after a restless hour or so in bed it became evident that sleep was a remote possibility. I reluctantly began reading the paper. Long story short, having read the paper I’m optimistic that my work still has something to offer and will hopefully still be published. However a visit to the researcher’s website invoked a second wave of anxiety. This particular researcher, who is now a postdoctoral fellow, had four first author publications and eleven publications in total prior to completing their PHD. This is not a discussion of quantity versus quality; I just wanted to raise the perhaps bleeding obvious point that as PHD students who aspire to forge a career in research, we are inevitably competing against other PHD students for career opportunities. Thus the bar is determined by the hours put in and quality of work produced by the post-grad researchers in our respective fields. As a relatively new PHD student this is something I’d, until recently, neglected to think about. I’ve been travelling along optimistic (naively?) that as long as I conduct good science and work hard the publications will come and opportunities will arise. Ultimately though, as hard as I may work, if those around me are working harder then I’m in trouble. The reality is that time is a precious commodity in this business and it would seem that to succeed it must be treated as such. So how do you strike the right balance in what in many ways seems to be a zero-sum game? If you had to tell a complete stranger a summary of your life in just three minutes, what would you say? 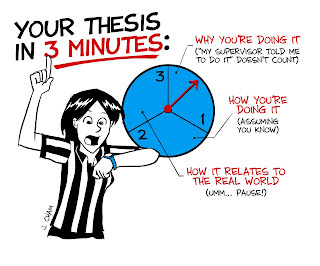 That’s what the Three Minute Thesis Competition is about... sort of. 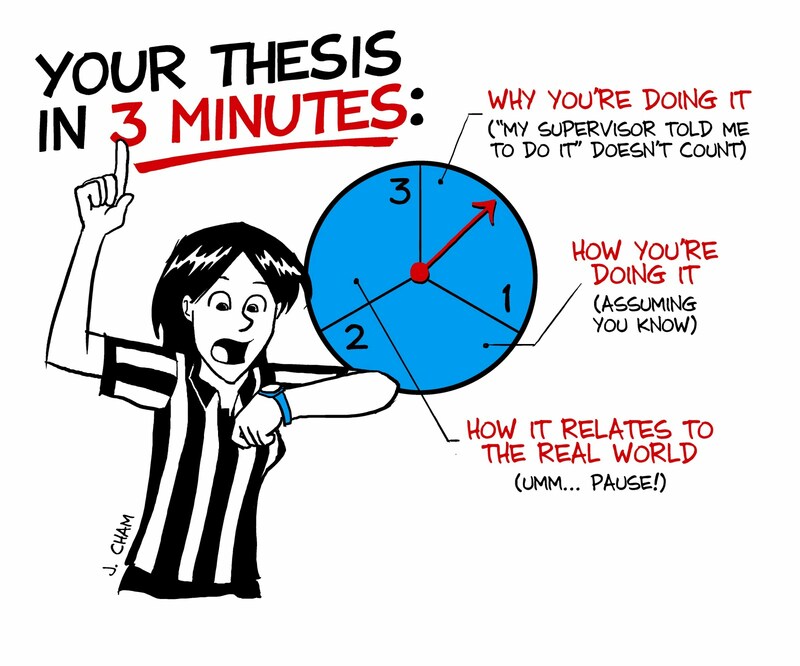 This year, resident UQ Psyc blogger Will Harrison is in the UQ finals of the Three Minute Thesis Competition and has to summarise his PhD research in three minutes. Will has to explain the topic of his research, why it’s important and why his results are so special. And if he takes even one second longer than three minutes, he’ll be disqualified. The main challenge of the competition is for the PhD student to explain their research so anyone can understand it. This means not using any technical language, such as referring to specific parts of the brain—the general public simply don’t know what the ‘parietal cortex’ is. Although it only takes three minutes, Will has put a lot of time and effort into preparing his presentation—as I’m sure the other seven competitors have—and the stakes are high. The UQ winner gets a $5,000 travel grant and goes on to compete against the winners from universities across Australia and New Zealand. Other entries on this blog have mentioned the chance for travel as a major perk of the PhD lifestyle. Speaking as someone who is currently halfway through a six-week trip to Europe, I wholeheartedly agree. So far the highlight of my trip has been the summer school organised by the European Association for Social Psychology. This summer school, like others, offered the opportunity to delve into a research topic over an intensive two-week period. Oh, and did I mention that it took place on a Greek island? I’ll give a bit of background for readers who are unfamiliar with the concept of a summer school. Many psychological associations hold these events for postgraduate students every few years. They can last anywhere from a few days to a few weeks and are designed to bring postgraduate students together to explore a particular research topic and collaborate with likeminded researchers. The typical format is of three to five topic “streams” with an internationally renowned expert (or two) acting as workshop coordinator. Students work on a broad research theme (e.g., intergroup emotions) in workshops and often break into smaller workgroups within the workshop to develop research projects. Many students go on to run and publish the studies they design at summer schools. Summer schools are a different from conferences. First, they are designed specifically for postgraduates. Second, they give the opportunity to learn intensively about a specific research topic for an extended period. Third, they often involve more raucous partying than conferences, because postgrads can be sure that their supervisor isn’t watching. I really enjoyed my recent summer school experience. Not only did I get to explore a new research area with top-notch experts to guide me, I also have a research project ready to run with international collaborators. Summer schools give people the intellectual freedom to move beyond the narrow research project that makes up a PhD. We tend to get so bogged down in our own little research topic that it will be a breath of fresh air to work on a completely unrelated project for a while. In addition to more practical outcomes, I have developed professional relationships and collaborations that will continue throughout my career. It was also bloody good fun and is probably the only time in my career that I will attend a research meeting in my swimsuit. 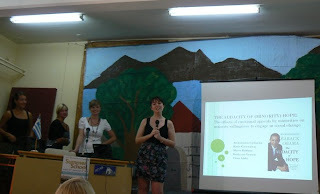 I think that experiences at international summer schools are particularly important for Australian PhD students. We are so isolated from the rest of the world, it is important for us to develop reputations and professional relationships overseas. I would urge all postgraduate students, particularly those who have just started their PhDs, to attend a summer school in your research field. I can’t guarantee it will be held on a Greek island, but at least you will get the chance to travel! For interested parties, UQ will be hosting the Australasian Summer School in Social Psychology in 2012. Research is about who you know. I’m not suggesting that if you know a journal editor, your article will get published without the hard yards. What you know is still important. I’m saying that, as research is all about sharing ideas, it stands to reason that the more people you know, the bigger variety of ideas you’re exposed to. If you know intelligent or creative people, you’re going to be involved in smarter or more novel ideas. Other PhD students are great for bouncing ideas around, and also help you learn about other fields. Your advisors not only give you access to extensive knowledge about their field; they have a lot of experience with theories and ideas. The people you know also affect the people you have access to. If your advisor has international collaborators, you have access to a broad and prestigious range of people in your field. If you’re part of a lab group, there are all the students and researchers involved. Attending school events expands your horizons to different fields and specialties, opening opportunities for interdisciplinary collaborations. Furthermore, the people you know can change how you keep up to date with research and news. If you don’t know anyone, new ideas and information are limited to your own imagination and what you read about in text books. On the other hand, you could read certain blogs because your friends do, attend particular conferences with your advisors, or even participate in competitions your co-workers get involved it, all of which exposes you to different people, research, and ideas. The people you meet might collaborate with you in new ways, expose you to better job opportunities, and expand your knowledge field. It is important to take advantage of the opportunities presented. The people you know could be your future advisors, employers, collaborators, a great source of new research or ideas, or just a friend to keep you sane during PhD! Being somewhat of an introvert, I often find it difficult to take my own advice, but when I eventually emerge from my lab, the benefits always outweigh the outside light burning my eyes. In my field (cognitive psychology) I have a huge access list. Not only friends and advisors with seemingly unlimited pools of knowledge and international colleagues, but also a large and active school of psychology, collections of psychology blogs through friends, up-to-date journal subscriptions through my university, state-of-the-art 3D vision lab, and vision mailing lists. I still need to put in the hours, but by taking advantage of all of this, the work I do has a much greater impact on my future.